I’ve been meaning for a while to draw from Harold Koenig’s book, Faith and Mental Health, and share with you some of the treasures of thinking and understanding I have found there. I wish I had the room here and the time to go into each of these points in detail. What will have to suffice is my testimony that I have found all these important in my Christian walk and important in my ability to be well. Not that I’m always perfectly well. Those who have come to know me will remember many times I have struggled. Yet my faith has grown and my mental health has improved since I began following Christ. I love my life. God has given me much to be grateful for. Good, non-judgmental Christian support is very important for those who suffer from mental illness. People with such illnesses need Christ-like love, so they will be encouraged in their faith – so they will benefit from their faith as described in the ten points listed above. 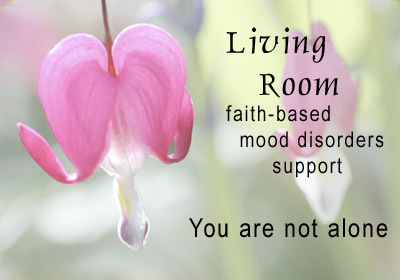 And I’m going to, once more, mention Living Room, the support group I facilitate. I am fortunate to have the support of my entire church. The church considers this one of its most important ministries. Many people are finding support – the kind of support only a faith-based group can offer. We are helping people put their trust in God. We are helping people have hope. Knowing this gives me joy and helps keep my own mental health strong. If this were only possible for more of those who suffer! Christians CAN help people with mental illness. I believe they want to. They only have to know how. They need the tools. They need the understanding.